SAN ANTONIO – Abimbola Ibitoye was positive her medicine was killing her. That’s how Ibitoye, who has been hospitalized since July at the Texas Center for Infectious Disease, describes her experience after being diagnosed with tuberculosis. She was taking 13 pills at the time to combat the infectious disease that affects the lungs. Ibitoye was nauseous, throwing up, couldn’t walk very well and was retaining fluid in her body. Texas’ rate of tuberculosis cases was nearly twice the national rate in 2017 with 1,127 cases reported, according to the Texas Department of State Health Services. Tuberculosis is still a rare disease, but public health experts are urging Texas legislators to invest in expensive medication, nurses who can help tuberculosis patients and supporting local health departments to test and treat people who may have been exposed. Jessica Gutierrez-Rodriguez, hospital administrator for the Texas Center for Infectious Disease, said it's difficult to explain to Texans why the center's work matters when it comes to warding off complex cases of tuberculosis. There were 9,105 U.S. tuberculosis cases in 2017, according to the federal Centers for Disease Control and Prevention. Tuberculosis bacteria is spread through the air from a person who has it in their lungs or throat who coughs, speaks or sings, according to the agency. It's not spread from saliva, touching someone's hand or sharing food and drinks. 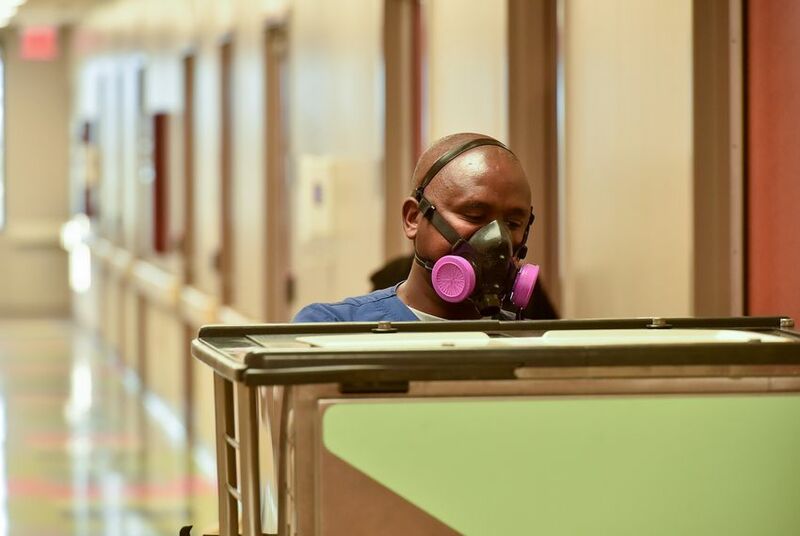 Ibitoye, 43, is one of 39 people receiving care at the Texas Center for Infectious Disease in San Antonio, a place deemed by state workers there as a last hope for patients who are sometimes on the verge of death when they arrive. The 75-bed hospital, run by the Texas Department of State Health Services, helps Texans and people nationwide who are referred by a clinic or need court-ordered treatment for severe cases of tuberculosis including multi-drug resistant cases. The facility also provides outpatient treatment for Hansen’s disease, known as leprosy. The average stay for a patient can be anywhere from three months to three years depending on the severity of their illness and how well their body responds to treatment, according to state officials. More than half of the patients admitted throughout the year are dealing with mental health or substance abuse issues. All have been diagnosed with tuberculosis, and sometimes come in with diabetes, hepatitis B, hepatitis C, HIV or AIDS, according to hospital staff. Ahead of the legislative session, the Department of State Health Services is asking for $27.2 million for its 2020-2021 budget to combat Texas’ TB problem. The funds would go toward: helping local health departments with screenings and testing for tuberculosis; increasing salaries for nurses; hiring more state workers to help with tuberculosis testing in communities without a health department; repairs and maintenance for the Texas Center for Infectious Disease; medication; and technology allowing medical providers to watch patients take their medication from anywhere. Janna Zumbrun, who was until earlier this year the associate commissioner for Laboratory and Infectious Disease Services for the Texas Department of State Health Services, said in an email that the agency received nearly $384,000 less for TB surveillance and prevention in fiscal year 2018 than it did four years prior. “The program’s budget is not keeping up with the need,” Zumbrun said, citing increasing costs of medication, testing and salaries. When Ibitoye was diagnosed with tuberculosis in May, she was living in Houston. After doctors realized that the medication was affecting her liver, they sent her to the Texas Center for Infectious Disease. Her recovery improved drastically within two weeks — “I was like a plant, I just grew” she said — and now she can talk to people without using a mask, she can walk without having to sit down as often, the nausea happens less frequently and she’s lost more than 100 pounds. At the center, she can walk the grounds, watch TV, take music classes and attend Bible study. She can visit her two children on weekends. The center throws going away parties for patients who are cleared to leave. “If you meet me outside without this badge, you might not know what is going on with me,” Ibitoye said, referring to her hospital wristband. People most at risk for developing tuberculosis include the homeless, people living with diabetes or HIV/AIDS, individuals with substance abuse problems, the prison population, health care workers and people born in a foreign country where tuberculosis is prevalent, according to the Texas Department of State Health Services. When an immigrant or refugee comes to the U.S., they are screened for tuberculosis using a skin or blood test. The screening is supposed to detect dormant tuberculosis, but it’s not always accurate. Dr. David Lakey, chief medical officer for the University of Texas System, said people may have been exposed to tuberculosis decades before arriving in the United States and the illness slowly manifests. He said as people’s bodies change, tuberculosis may not fully display until a certain situation, such as if someone develops diabetes. Lakey pointed out that the U.S. is still doing better than other countries when it comes to fighting tuberculosis. Meanwhile, India, China, Indonesia, the Philippines, Pakistan, Nigeria, Bangladesh and South Africa accounted for 66 percent of new tuberculosis cases worldwide in 2017, according to a World Health Organization report released in September. "There’s not a part of the world that is immune from this,” Lakey said. Ibitoye, an immigrant from Nigeria, couldn’t believe her diagnosis. She recalled how she reacted when hearing someone back home had tuberculosis and knew the potential stigma she would face. She feared being alone and people running away from her. “If I heard that somebody has TB I tried my best to avoid that person for the rest of his or her life,” Ibitoye said with a laugh. Dr. Annie Kizilbash, medical director for the Texas Center for Infectious Disease, said she and other doctors have to find the right combination of medication that patients can tolerate, which can be a tough and costly feat. She noted that tuberculosis can also spread beyond the lungs to the brain, bones, spine, kidneys and other organs. It costs $880 per day to care for a patient with drug-resistant tuberculosis, according to the department’s budget request. The state is having trouble recruiting nurses to help tuberculosis patients in communities and at the Texas Center for Infectious Disease. The hospital is often competing to keep nurses from leaving for the San Antonio State Hospital, a facility for patients needing mental health services, and the San Antonio State Supported Living Center, a place for patients with intellectual developmental disabilities, where workers are started at salaries averaging 15 to 20 percent higher. All three facilities are on the same campus. Nurses at the Texas Center for Infectious Disease have 12 hour shifts where they’re on the front line with patients every day, monitoring their medication, collecting patient samples for lab tests, making sure patients are getting sunlight, getting patients socializing and giving doctors updates. Luis Ponce, the interim director of nursing for the Texas Center for Infectious Disease, said he lost 26.1 percent of his staff in the 2018 budget year. The turnover means the hospital is constantly training newly hired nurses. “It takes a lot of time to educate someone because there is no actual training course to treat TB for nurses or for bedside nursing, there’s none,” Ponce said. Some patients stay in the center until their treatment plan is complete, while others may continue their treatment in the community. The hospital gives recommendations to the local health department on how to look after TB patients, including how often they need their drugs, what side effects to look for and how often they need chest X-rays to check their lungs. Some patients don’t have a place to live, said Dr. Sergio Orozco, director of behavioral services for the Texas Center for Infectious Disease. When patients arrive, hospital officials start thinking about how to set them up for leaving. He said the goal is to not just hand them their pills but make sure that they have access to housing and mental health services when finishing their treatment in the community. If they believe a patient is at risk for relapsing or not following their treatment, then they keep them at the hospital. Ibitoye is slated to finish her medication regimen by March. But she admits she’s worried about what will happen when she leaves. She has to get her personal items out of storage, find somewhere to live, get a job and be able to afford health insurance for her follow-up doctor visits. But she’s looking forward to seeing her two sons, a four-year-old and one-year-old, everyday instead of on weekends. Disclosure: The University of Texas System has been a financial supporter of The Texas Tribune, a nonprofit, nonpartisan news organization that is funded in part by donations from members, foundations and corporate sponsors. Financial supporters play no role in the Tribune's journalism. Find a complete list of them here.